Did I say we had been busy? Well we have. Hot on the heels of the Guardian article about female TV presenters, The Refinery was asked to write an article for a national magazine based on the experiences we had had making a documentary with Simon Donald (“Him Off The Viz” – yours for just £16.99 from Amazon). She died in the 1990’s and the documentary was Simon’s way of looking back at events which he had felt unable to address emotionally at the time. Part of the process involved a visit to a neurologist to undergo an exam typical of the kind that a patient with MS would experience. Imagine the bombshell when the neurologist turned to Simon and said “I’m sorry to have to tell you this, but you have MS too”. 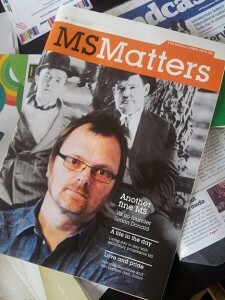 The documentary follows Simon as he comes to terms with his diagnosis, and when they heard about it, MS Matters, the magazine for the MS Society, asked us to write up some of Simon’s story as an article which appeared in their July/August edition. He even got the front page, the handsome bugger. As for the documentary – keep watching this space. 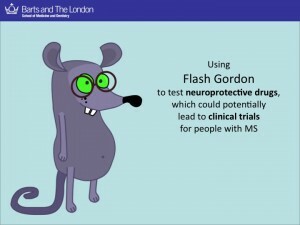 The REFINERY has been busy editing the talks from the Barts Multiple Sclerosis Research Day for Patients and their Families, which was held at Church House Conference Centre at the end of March 2011. Despite accidentally coinciding with the massed unions anti-cuts protest march which brought most of central london to a standstill, the research day was unaffected, with a few people who would otherwise have joined the march tweeting their support from inside the venue. As well as filming the events of the day, we also created some quirky, fun films to introduce some of the key speakers, and were also involved in creating some humorous animations and cartoons to help explain some of the concepts. It also saw Friend of the Refinery, Simon Donald (“Him Off The Viz”) give a short talk about his experiences making a documentary with us (see this page for the trailer) and the world premier of a specially commissioned animated sequence (“MStermind”) by Oddball Media. The day was a resounding success with positive feedback from attendees and contributors alike. The talks and films can be found on our youtube channel and also on our own event web page. The REFINERY was thrilled to be asked to support the Neurosciences Team from Barts and Queen Mary’s University of London as they held their second Multiple Sclerosis Research Day for Patients and their Families. We had the great pleasure of filming the inaugural research day in 2010, but wanted to help the 2011 events be bigger, better and more engaging than ever. 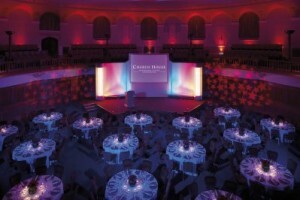 This year, we came along and did some filming with key speakers before the event itself. This let us prepare some short films with music, stings and a bit of humour to help introduce the speakers. In addition, we commissioned and produced some excellent animations which helped lift the power point presentations and make them less academic and more engaging. Adding music and a bit of fun helped create a lightness of touch to the day that attendees appreciated, giving overwhelming support and positive feedback for the new elements included the day’s proceedings. Simon’s Adventure’s in Brain Science. Simon Donald is probably best known for being one of two brothers who founded witty and irreverent magazine du jour of the 1980’s, Viz magazine. Behind the humour, lay a sadder story. Simon’s mother, Kay, was diagnosed with Multiple Sclerosis as a young woman. After his birth, her health deteriorated badly. By the time she was 35, she was wheelchair bound, and she died in her 50’s, in 1994, unable to walk, speak or eat unaided, and never able to play as full a part in the lives of her three sons as she would have wanted. Thank you for attending the first Barts and The London Research Day for People with Multiple Sclerosis and their Families. The primary aim of this meeting is for the Neuroimmunology Group at Barts and The London, Queen Mary University of London, to update you on the latest research in multiple sclerosis; with a particular focus on the research we are involved in. The idea for today’s meeting came from a session we held for people with MS in Southend last year. The specific purpose of that session was to ask people with MS to be part of a specific research project we were undertaking. The meeting was a great success; we recruited over 30 people with MS for the study. But both during and even after the meeting, we received several requests to consider making it an annual event and also to give feedback to the participants on the results of the research project, if we could. So it seemed we had found a forum that people with MS and their families could benefit from in ways we hadn’t appreciated before. The meeting also allowed people with MS and their partners to meet and talk to scientists informally in a relaxed environment over drinks. Another reason for holding today’s meeting is to fulfil our obligations to the funders of our research, who require us to engage with the general public, people with MS and their families and other people with an interest in MS. We also believe you have the right to know what we are spending our research money on, as the purpose of our work is to improve our knowledge and understanding of MS with the goal of improving the lives of people living with this disease. We did a web-based survey of people with MS to explore what would be the best forum for disseminating information about our research. To our surprise people with MS want it all; a website, a blog, a facebook site, a twitter site, regular emails, newsletters, webinars, question and answer sessions and regular meetings like this. We have already launched a blog and will soon be launching a website. We also plan to post our lectures on the web. For us as a group of MS researchers, this initiative has allowed us to reflect on our work, assess its potential impact and plan for the future. For example, for some of the research projects you will hear about today, we need your help; this may be as a volunteer for a particular study or simply helping us to spread the word. Another benefit for the group is that the day brings us together without the usual weekly distractions and hence provides us with an opportunity to celebrate our successes. I am also very proud to lead the Neuroimmunology Group at Barts and The London and would like to take this opportunity to thank them all for their achievements and commitment and perseverance towards our ultimate goal: a world free of MS.